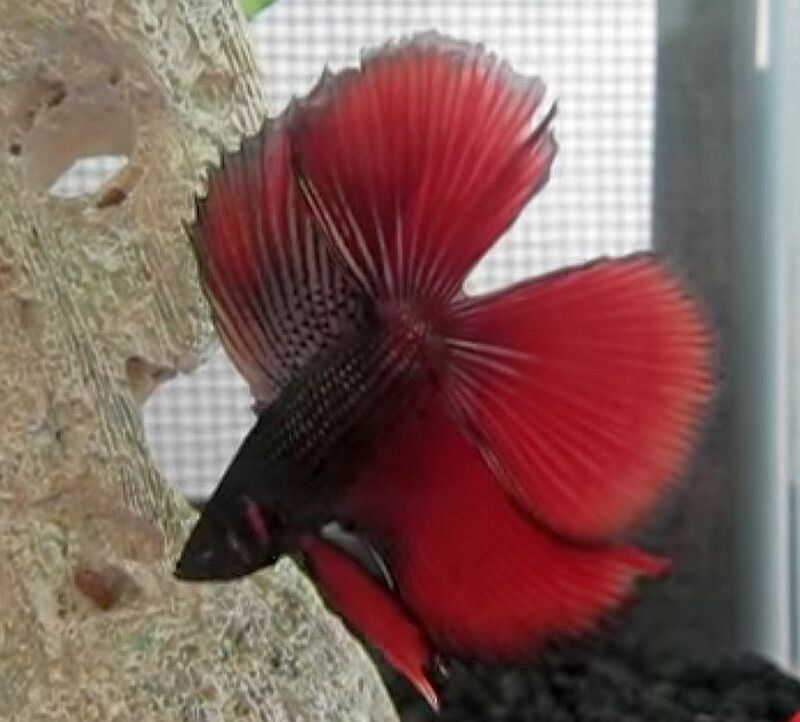 The Twin Tail variety of Betta splendens is also called the Double Tail (DT) Betta and has an unusually striking tail that immediately differentiates it from other Betta types. The Twin Tail or Double Tail Betta, as you can surmise from its name, has a caudal tail that is split into two equal lobes rather than one. They also have shorter, more compact bodies than other tail types which leaves them more susceptible to having swim bladder problems; a common disease for these types. Because the Twin Tail Betta have such beautiful dorsal fins, they are frequently crossed with other Betta strains. Over the years, male Siamese Fighting Fish (Betta splendens) have been bred to enhance the type and length of their fins, their remarkable colors, and variations of both. for betting purposes, two males are placed together in a single small tank until one fish incapacitates or kills the other. Unfortunately, this combative trait has not yet been bred out of males. 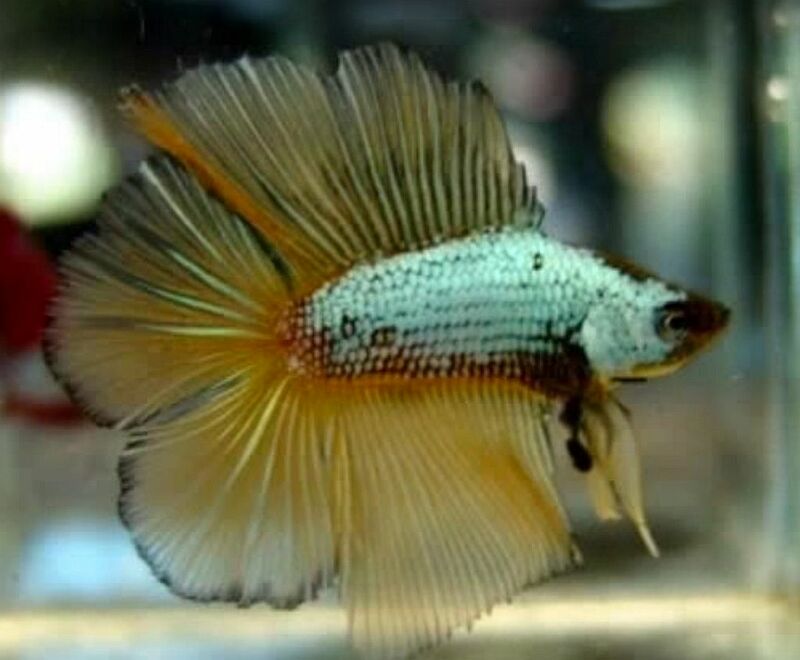 Female Betta splendens are often as colorful as the males but they do not possess the long varied fin types that the male Bettas are adorned with. 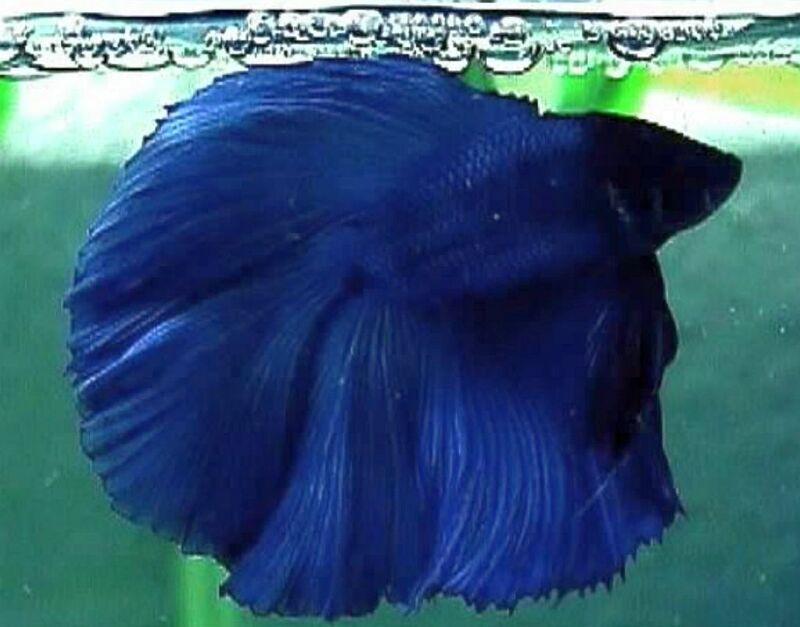 A male and female Betta splendens can be temporarily kept together for breeding purposes. After the eggs have been dropped by the female, fertilized, and placed into the bubble nest, the female should be removed from the breeding tank. The male Betta will tend to the eggs until they hatch, usually hatch within 24 hours. After hatching, the fry should be fed infusoria, finely crushed or powdered flakes, and newly hatched brine shrimp. Bettas should never be kept in the small bowls you often seem them in at department stores or discount chain tropical fish shops. They do best in a well filtered tank of at least 1 gallon capacity, at a temperature between 75° and 86°F. They also appreciate some freshwater plants or driftwood roots in their tank for them to hide in. Adult Twin Tail Bettas need a carnivore diet of flake food, frozen or freeze dried bloodworms , tubifex , and brine shrimp. Twin Tail Betta Splendens are usually around 1-3/4″ to 2-1/2″ long when offered for sale.